November 30, 2018, peacefully, at hospital, dearly loved husband of the late Annie, loving father of Etta, Sammy, Eileen, and Brian also a much-loved father-in-law, grandfather and great-grandfather. Service of Thanksgiving for his Life will take place on Friday 7th December in Donegall Road Methodist Church at 10.00 a.m., with committal afterwards in Roselawn Crematorium. 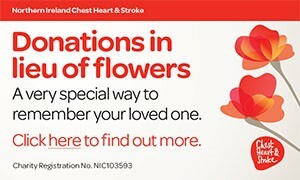 Family flowers only please donations in memory, if desired, to N.I Chest, Heart and Stroke c/o Melville Morgan Funeral Directors 257 Lisburn Road, Belfast BT9 7EN. He will always be loved and remembered by the entire family circle. Sadly missed by his loving daughter Eileen and grandson Glenn and granddaughter Rebekah. Deeply missed by son Sammy and wife Ann, grandchildren and the McCrory family. I am sorry to tell you that Charles Neilly HUNTER has passed away.